4 Stalk Rots in Field Corn? Last week temperatures ranged from near normal to more than 4 degrees above normal in parts of western and southeastern New York. Precipitation ranged from ¼ inch in parts of western New York to more than 4.5 inches in parts of eastern Long Island. Base 50 growing degree-days ranged from less than 80 in the Adirondacks to more than 160 in parts of southeastern New York. A cold front sparks some showers Thursday, followed by dry, sunny conditions for the weekend. Friday will feature some morning showers, mainly in the eastern half of the state. Otherwise, the day will be mostly to partly sunny with highs ranging from near 80 to near 90 degrees. Lows will be in the mid 50’s to mid 60’s for much of the state. Saturday temperatures will be in the upper 70’s to upper 80’s, with mostly sunny skies. Overnight temperatures will be in the mid 50’s to mid 60’s for most areas. Sunday highs will also be in the upper 70’s to upper 80’s. Expect mostly to partly sunny skies for much of the day, with a slight chance of showers late in northern and western New York. Overnight temperatures will be in the 60’s. Monday expect partly to mostly cloudy skies with a chance showers and thunderstorms as a cold front slowly moves across the state. Highs will be in the upper 70’s to upper 80’s. Lows will be in the upper 50’s to upper 60s. Tuesday morning there could be some lingering sprinkles in southeastern parts of the state. Otherwise, skies will be partly cloudy. Temperatures will be in the mid 70’s to mid 80’s. Lows will be in the upper 50s to mid 60s. Wednesday temperatures will be in the mid 70’s to mid 80’s, with mostly to partly sunny skies. Lows will be in the upper 50s to mid 60s. The five-day precipitation amounts (Aug 25-30) will range from less than 1/10” in southeastern New York up to 1.25” in parts of central and southwestern New York. The 8-14 day outlook (August 31-September 6) shows increased chances for above normal temperatures and above normal precipitation for the entire state. The September outlook shows no indication for above or below normal temperatures or precipitation. The September/October/November outlook shows increased chances for above normal temperatures. There is no indication for precipitation. The Drought Monitor: While the state did receive some rain during the past week, there was not enough precipitation to make much of a dent in drought conditions. The Drought Monitor released on August 25 shows similar conditions to last week, with 45% of the state in a drought and 41% of the state abnormally dry. Jerry Cherney – Forage Trial Process from Cornell Field Crops on Vimeo. 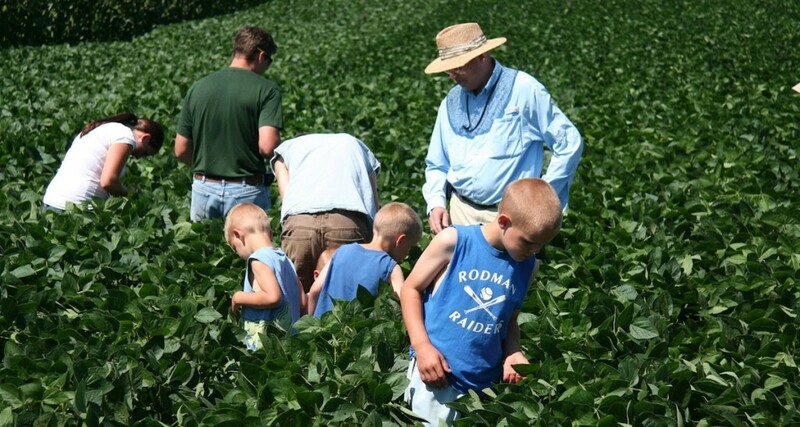 Dr. Jerry Cherney discusses the process of conducting forage trials on cooperative farms. 3 Planting Winter Small Grains? What are the Pest Issues? Last week temperatures ranged from 4 to 10 degrees above normal. Precipitation ranged from 1/2 inch to over 4 inches. Base 50 growing degree-days ranged from 140 to 220. Today will be a slight chance for showers and thunderstorms with temperatures in the mid 70’s to mid 80’s. Overnight lows will be in the mid 50’s to mid 60’s. Friday will be dry and warm with highs will be in the 80’s and increasing humidity. Lows will be in the mid 50’s to mid 60’s. Saturday temperatures will be in the mid 80’s to near 90 and humid with a slight chance for afternoon showers. Overnight temperatures will be in the 60’s. Sunday highs will be in the mid 80’s to near 90 again, an afternoon/evening cold front will bring a chance for showers and thunderstorms. Overnight temperatures will be in the 60’s. Monday highs will be cooler, in the upper 60’s and 70’s with a few lingering showers. Lows will be in the 50’s. Tuesday temperatures will be in the upper 60’s and 70’s. Lows will be in the 50’s. Wednesday temperatures will be in the 70’s. Lows will be in the 50’s. The five-day precipitation amounts will range from ¾” to 1.5”. The 8-14 day outlook (August 25-31) shows increased chances for above normal temperatures for all of the state. There is no indication for precipitation. The September/October/November outlook show increased chances for above normal temperatures. There is no indication for precipitation. The Drought Monitor: Enough rain (more than 2 inches) fell for a one-category improvement in extreme southwestern and south-central New York. However, some portions missed out on the heavy rains (e.g. western New York) where less than 0.5 inches fell. Accordingly, conditions deteriorated there, two new D3 areas (Extreme Drought) in western New York, one along the I-90 corridor, and another in the southern Finger Lakes region. Jerry Cherney – Drought Effects on Alfalfa-Grass Mixtures from Cornell Field Crops on Vimeo. Dr. Jerry Cherney discusses the effects of drought on Meadow-Fescue as part of a low-lignin Alfalfa-Grass trial. 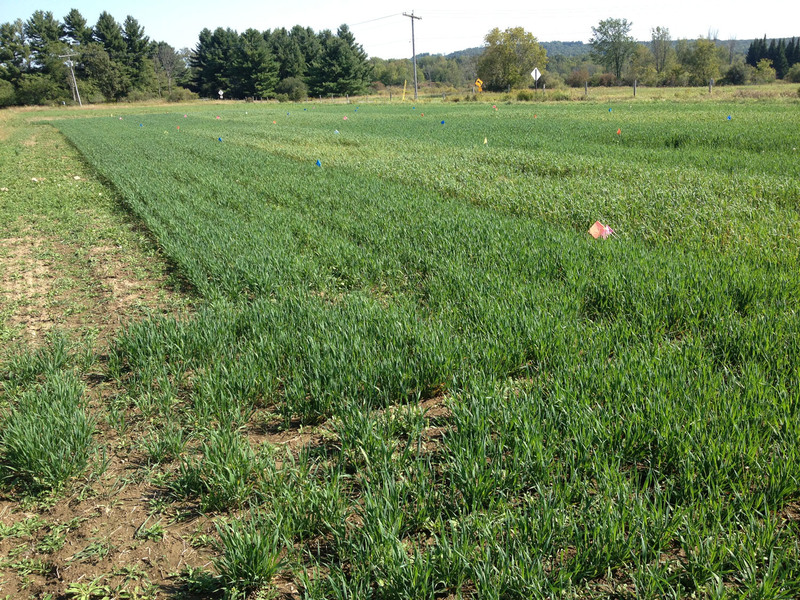 This photo shows the Northern New York Agricultural Development Program-funded oat forage trial at Canton, NY, on September 16, 2015, 43 days after planting. The forage variety plots were heavily impact by crown rust while the grain variety oat plots are less visibly diseased. Photo: K. O’Neil. Northern New York. Hot, dry summer conditions can lead to insufficient hay and pasture forage for dairy farms. Could late summer planted oats be an option to fill that forage gap? A farmer-driven Northern New York Agricultural Development Program has posted results of recent field trials as field crop specialists prepare to plant a new trial at three NNY farm sites. Drought conditions early in the 2015 growing season and a fungus impacted the summer oat trials planted in 2015 at the St. Lawrence County Extension Learning Farm in Canton, W.H. Miner Agricultural Research Institute in Chazy, and at a farm near Alexandria Bay, NY. Research plots planted in 2013 and 2014 at the privately-owned farm near Alexandria Bay served as a preliminary indicator suggesting that late summer-planted oats are capable of producing high quality, high yielding forage. Lack of soil moisture caused the plots at Alexandria Bay to fail completely in 2015. Forage quality of the crop harvested at the other locations was very good, but the lack of rain caused very poor yields. Crown rust, a common fungal disease of wild and cultivated oats, damaged plantings at all three farms in the study last year. The research project funded by the farmer-led Northern New York Agricultural Development Program continues in 2016 with crown rust-resistant varieties. The research team led by Kitty O’Neil and Mike Hunter, field crops specialists with the Cornell University Cooperative Extension NNY Regional Ag Team, expects results form the 2016 to give a clearer indication of the potential of summer oats to provide Northern New York farmers with an emergency annual forage crop option. Data including a summary of weather conditions during the 2015 growing season, trial plot forage yields, the incidence of crown rust infections, and a summary of nutritional quality is posted in the 2015 project report in the Field Crops Research: Oats section of the Northern New York Agricultural Development Program website at www.nnyagdev.org. The farmer-driven Northern New York Agricultural Development Program provides grants for on-farm research and technical assistance projects in Clinton, Essex, Franklin, Jefferson, Lewis and St. Lawrence counties. Funding for the Northern New York Agricultural Development Program is supported by the New York State Senate and administered through the New York State Department of Agriculture and Markets. Last week temperatures ranged from near normal to 6 degrees above normal. Precipitation ranged from less than a quarter inch to over 2. 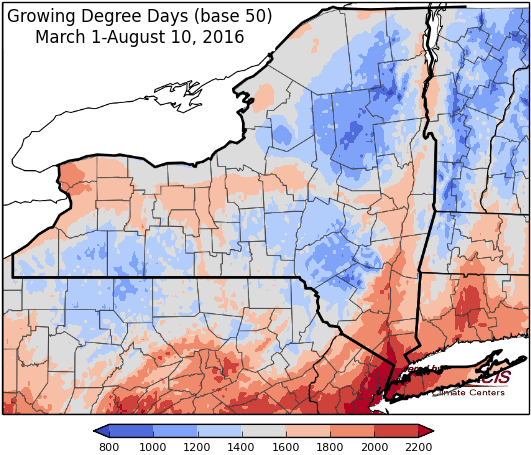 Base 50 growing degree-days ranged from 100 to 180. Rain! Showers and thunderstorms through early next week… flash flooding possible! Today will be warm and muggy with temperatures in the mid 80’s to low 90’s. There will be scattered showers and thunderstorms with locally heavy rainfall. Overnight lows will be in the mid 60’s to low 70’s with scattered showers. Friday highs will be in the mid 80’s to low 90’s and humid with scattered showers and thunderstorms; localized heavy rain and flash flooding potential. Lows will be in the mid 60’s to low 70’s. Saturday there will be more widespread showers and thunderstorms with the potential for localized heavy rain and flash flooding. Temperatures will be in the upper 70’s and 80’s, humid conditions continue. Overnight temperatures will be in the mid 60’s to low 70’s. Sunday showers and thunderstorms continue with highs in the mid 70’s to mid 80’s. Overnight temperatures will be in the 60’s. Monday highs will be in the mid 70’s to mid 80’s. Lows will be in the 60’s. Tuesday things dry out and temperatures will be in the mid 70’s to mid 80’s. Lows will be in the 60’s. Wednesday temperatures will be in the 80’s. Lows will be in the upper 50’s to mid 60’s. The five-day precipitation amounts will range from 1 ¼” to 3” . The 8-14 day outlook (August 18-24) shows increased chances for above normal temperatures for all of the state. 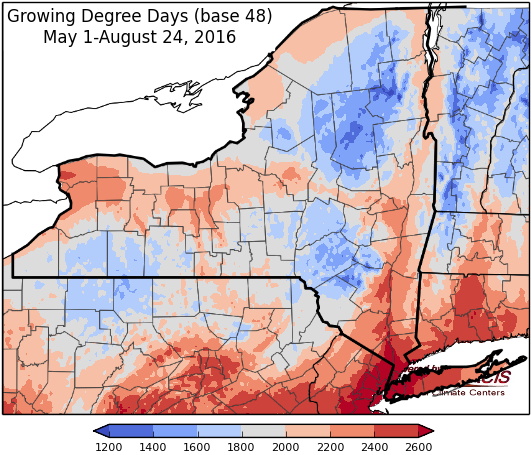 There is an increased chance for above normal precipitation for southwest NY. The Drought Monitor: Areas of abnormally dry conditions, moderate & severe drought expand.